I recently finished reading a fantastic book about the longest living regions in the world. Dan Beuttner visited and studied zones in Sardina, Italy; Okinawa, Japan; Loma Linda, California; and Nicoya Peninsula, Costa Rica. 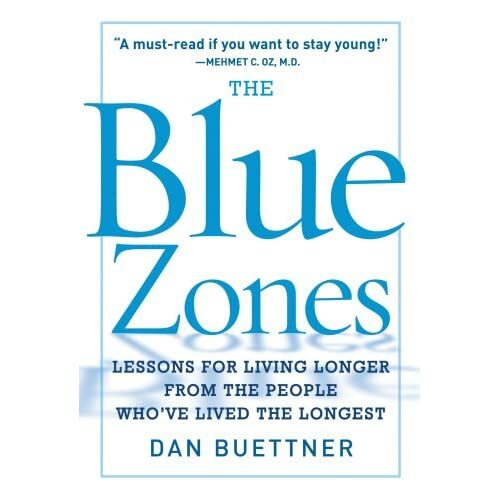 He found that each region has similarities in culture, nutrition, and activity levels and used his studies to create The Blue Zone, a book and online resource to improving your chance at longevity. The book is inspirational in that it makes you realize that doing a few things consistently can go a long way. Many people in each of theses zones lives to be 100 years old (a centenarian). Now, many people would say they don’t want to that long because they don’t want to be old, sick, and in pain. But, these people live to be 90-100 and are still happy, free of disease, and physically/cognitively active. As a Physical Therapist, I am routinely surprised at how many people I see in my outpatient clinic after a hip or shoulder replacement who are 85 – 90 years old and still living alone. As a health care provider my first instinct is to go at lengths to find out why they should not live alone due to safety concerns. This books makes me reconsider these ideas. Many people can live safely into their 90-100s if they follow the Blue Zone practices. San Francisco is known for his healthy, organic, and active lifestyles but we are still in America where people work too much, stress too much, and put exercise and personal issues on the back burner. Somehow the folks that have walked through my door for physical therapy have found the healthy balance. The trend I saw between all the cultures Dan studied are that they all have a genuine purpose in life as they age. They continue to care for or live with their family and may work a job into their 80-90’s. They also act without worry and are constantly re-inventing their ideas. The end of the book gives multiple lessons for strategies to incorporate the characteristics of these zones into your life. Of course after reading the book, you are tempted to begin living every strategy immediately. I went online to Bluezones.com to calculate my life expectancy and got personalized suggestions to lead a more healthy life. After taking the vitality compass quiz, I found that my biological age is 27 (I am really almost 32), and my life expectancy is 93 if I continue with the same habits. Being the competitive person I am, I decided I could still make some changes in my habits. Below is a summary of the tips I feel are easy most easy to work on and achieve. 1) Drink wine – Great! Sardinian Italians drink high vitality red wine or dark red wine up to 2 glasses / day. It contains high levels of flavenoids to help keep arteries flowing. No problem. 2) Drink coffee with hard water – Coasta Rican Nicoyans drink coffee with hard water infused with high levels of Calcium. No problem. 3) Get at least 15 min of sun/day – Again I probably do not get my sun in moderation but I love my vitamin D infused sun rays. Both Nicoyan Coasta Ricans and Okinawans routinely get a daily dose of sun. Vitamin D promotes strong bones and prevents heart disease. 4) Keep moving – Sardinian Italians hike up to 5 miles / day to their mountainside gardens. Walking your pet or commuting by bike to work can keep your metabolism in check regardless of what your exercise habits might be. Historically people have been able to maintain their body weights without making a trip to their gym or trainer every day. They did not have to schedule the workout into their routine…It just happened. 1) “Hara Hachi Bu” – an Okinawan prayer meaning “eat until you are 80% full.” The reasoning is because it takes your brain 20 min to feel that your stomach is full. Eat slower and until satisfied and risk of overeating dramatically decreases. 2) Take Yoga – exercise with a spiritual focus will bring more meaning to your practice. Yoga also emphasizes breathing techniques and meditation which are both effective for stress reduction. 3) Eat Nuts – Loma Linda Adventists make a habit out of eating some form of nuts at least 5 days/week. This reduces the risk of heart disease by 50% and adds another 2 years to your life expectancy. 4) Predisposition – The people studied in these regions celebrate elders, laugh a lot, have an attitude, maintain their social network of friends/family, volunteer, sleep 7-9 hours / night, keep hard a work and celebrate a common history. – Soy – Okinawans have a diet rich in tofu and miso soup which helps protect against heart disease and breast cancer. – Turmeric – Rich in Okinawan diets and contains antioxidants that may decrease inflammatory diseases. – Goya (bitter melon) – Okinawans primarily eat a plant based diet including cucumber-like Goya which is is rich in antioxidants and is a compound that lower blood sugar. – Oranges – Costa Rican Nicoyans routinely eat oranges which are suppliers of vitamin C, potassium, and folate and help prevent heart disease, cancer and stroke. – Sweet Potatoes – Rich in Okinawan diet, are high in fiber, minerals, vitamin A, Potassium, Vitamin C and folic acid. – Cooked Corn – Nicoyans heat a diet rick in maize (corn) that is cooked with calcium hydroxide which contains a higher level of calcium and antioxidants. Find inner peace with your “plan de vida” – think about what your day is meant to be and what you are going to achieve but don’t worry about the things you have not accomplished yet. Your circle of friends, family, and good health will support you with achieving these goals in the future. Take each of the recommendations above as goals. Attempt in making 1-2 changes every month and you will see the changes in the long term. This is an excellent read for the holiday break in that it will motivate you to improve your health through daily and natural processes for the New Year. Happy holidays and happy reading. The Blue Zones, Dan Beuttner, National Geographic, Washington, DC, 2008. Finally getting a chance to check out your blog…just in case you didn’t know, your mom included the site address in her Christmas letter…ah, what a proud mom she is! You probably won’t be able to put a face with the name but I am an old friend of your mom from high school. I remember taking you back and forth to Kernel volleyball camp a few times as you were new to town and I was working at the camp. I had a chance to see your mom and Santa (AKA…your dad) when they were in town over Christmas. Love the blog and plan to follow it as it grows. I still teach Physical Education and do all that I can to keep it up to date and fresh. With school laptop computers in every 7th through 12th graders hands 24/7 I am always on the lookout for sites to share with my students. I am proud to say…PE is no longer your parents ‘gym class’…I work hard to steer it away from ‘sports class’ to personal, individual lifetime fitness exploration. Yoga, pilates, strength training, cardio-respiratory training, stability balls, POLAR Heart Monitors…and much, much more…are all routine pieces of the new and improved Physical Education. Personally, I cannot say enough about what yoga has done for me and will bend anyone’s ear that gives me the chance! Keep up the great work, Jess! I definitely remember you Cheryl. That is great you are paving the way for the future of what most non-athletes and athletes will have to do to maintain their bodies. My next post is on Yoga and Pilates. Great to hear from you! Happy New Year.